Gozio helps deliver patients, families and caregivers efficiently, effectively, and safely to their final destination within the healthcare system. 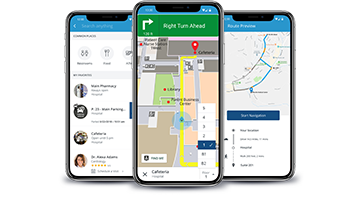 Travel seamlessly from home to the hospital parking deck to the waiting room using Gozio’s blue dot navigation guidance. Digitally empower your patients through a new and engaging communications channel available through any mobile device. Gozio provides an anytime, anywhere connection between hospitals and patients. Engage patients with your hospital branded mobile app while strengthening loyalty and steering repeat business to your healthcare system. Our customers and our customer’s customers love us! Hospitals can be challenging to navigate, but when your child is sick or injured, you just want to get them better as fast as possible. By introducing this unique technology, we can help a parent quickly navigate our health care system to easily get to where their child needs to be. Providing stress-free, safe guidance to the hospital is a top priority for improving patient experience. By employing Gozio’s powerful, innovative technology, our patients and families will feel confident in arriving at their destination anywhere in the Piedmont Healthcare system. I used the Children’s app on a recent visit to the Scottish Rite Hospital. The app makes it super easy to navigate the hospital. Any part of the hospital is reachable with a simple map and the app is smart enough to redirect you if you get off track. This software is proactive and patient focused. The Children’s mobile app is amazing! It has made our visits to the hospitals and urgent care centers so much easier. The items we have used the most are locating compounding pharmacies, finding nearby restaurants and searching for doctors. The mobile app has put everything into one place. Gozio’s mobile platform is another example of how we leverage the latest technological solutions to improve the patient experience and increase convenience for all visitors to our newly opened medical center. UHealth’s commitment to providing the best innovations in patient care extends to improving the patient experience before they even walk through the door. With mobile wayfinding, patients can rest assured they have a navigational tool for their health care journey at their fingertips. Improved patient experience and engagement effects your ROI. Let an effective mobile strategy empower your patients and families toward better health. Gozio expands your potential reach by now offering the mobile app in Spanish. Additional language translations will be available soon.